I often have clients that have their business logo designed already and need help in designing business cards, adverts or other graphic design for print. When asked to provide the logo files they send me often files that are not acceptable for print, sometimes not even for web! I even came across few cases where the business owner was provided with only large PNG file! Moreover, they put an additional price on other file formats, which I find ridiculous! So I have decided to explain to you basic formats of logo files that you should get hold of and where to use them as well as which to request from your designer in order to make the most out of your logo and be able to use it appropriately. JPG’s are the most common image formats that most of us are familiar with. They can be easily placed in most of the other well knows software programs such as Microsoft Office. Most of our cameras save photos in JPG format, so anyone who uses computer probably came across it. There are few problems with this file format, they don’t resize well and graphics will always have a background fill, hence when saving JPG file we need to consider how there are going to be used. This should be saved in resolution of 300dpi and CMYK colour mode as well as should be large enough to be used on most printed materials. This should be saved in resolution of 72dpi and RGB colour mode (as opposed to JPG for print) as well as should be in a size so it fits well on your website. Note: If you need to use your logo on a coloured background it needs to be saved together with this background. In this case it is better to use transparent PNG file (see below). PNG files are mainly used for web. They allow for a transparent background so are very useful when placing onto filled backgrounds. However they have the same limitations as JPG because both are pixel based therefore should be saved big enough to avoid resizing. PDF is a file format that can be viewed by any computer that has the Adobe Acrobat installed. It is one of the mostly used formats as it is scalable and can also be saved as editable and is perfect for supplying print-ready artwork. 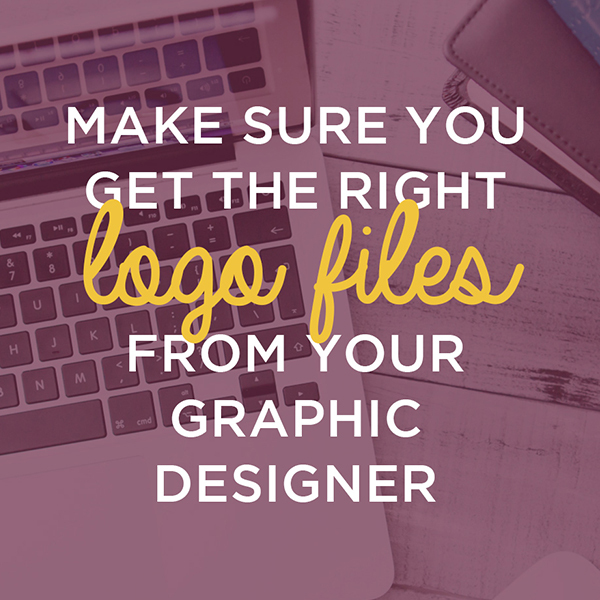 Make sure your designer provides you with your logo saved in vector PDF. This is a vector file with transparent background that can be resized without losing on quality. It can remain editable, meaning you can open it in vector software such as illustrator and edit all elements. EPS can also be converted to any format that is needed. It is important to have this file format of your logo in case you ever wanted to update it and found a new designer that suits you better or in case your designer lost your logo files (computers or back ups drives get broken sometimes!). It is very useful to have it, so make sure you ask your designer to provide you with it. NOTE: If your designer says that they are working on your logo in Photoshop you will not going to get EPS file or any files that will be useful for you or your printers when applying your logo onto printed materials. It will definitely cause you problems in the future, so please make sure you don’t purchase any logos that were created in Adobe Photoshop! As you can see there are different logo file formats you will need depending on specific usage. Please make sure you get all of the above listed formats. If for any reason your designer doesn’t want you provide with those, it should make you think if they are competent and honest enough. Have you ever found yourself in a problematic situation because you didn’t have a suitable file? Please share your experiences below.